Posted on January 2, 2012 by Ronald Patrick Raab, C.S.C. The first priest of the Congregation of Holy Cross to serve as pastor of the Downtown Chapel was Reverend Richard Berg, CSC who began his ministry in the late 1980’s. He served until 2001. During the Provincial Chapter of the Indiana Province in 2000, the Holy Cross community decided to make the Downtown Chapel a commitment of the community. In 2001, Reverend Robert Loughery, CSC was appointed pastor of the Downtown Chapel as the first pastor in this new agreement between the Archdiocese of Portland and the Congregation of Holy Cross. He served as pastor until 2010. In July 2010, Reverend Steve Newton, CSC was assigned as pastor to the Downtown Chapel. The name change of the Downtown Chapel to Saint Andre Bessette Church serves as a sign of the commitment of the Congregation of Holy Cross to the ministry of people living in poverty and surviving homelessness, mental illness and addictions. The presence of Holy Cross also makes the commitment of education and formation for people serving other people in the issues of social justice and nonviolence. The Congregation of Holy Cross also serves the University of Portland and Holy Redeemer Church in Portland, Oregon. was also the first male to be canonized from Canada. His simple life and ministry of healing provides for our parish community a patron that certainly lived a life identifying with suffering and poverty, with illness and homelessness. This moment in our parish community of changing our identity, our name, is significant for our parish and very significant for the Congregation of Holy Cross. This photo was taken on Sunday, October 17, 2010 during our parish celebration of Brother Andre’s canonization in Rome. 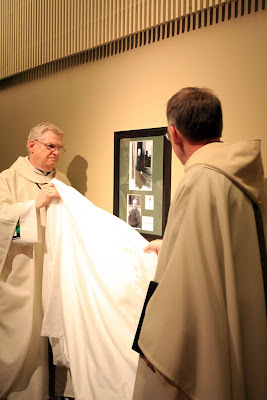 The photos of Brother Andre and the relic are now a part of our worship space.